My piece attempts to answer the question “What do our shoes say about us?” by using machine learning to analyze and classify the bottom of users’ shoes. Sole Identity captures ones out-sole and tries to determine the intended purpose the shoe was designed for. Much like a thumbprint, one’s shoe print has unique characteristics that can identify an individual. In the shoe design process, special attention is paid to the sole because of its importance in ensuring durability and comfort. Once a person’s shoe is identified as either a casual, skate, or athletic type, an image of the shoe is then placed into an environment where it is animated and interacts with other pairs according to characteristics specific to their classification. The goal of the project is to demonstrate to the user how their shoes were meant to behave. By giving life to ones footwear, a person can visually understand the purpose of their shoes and determine whether their shoe choices do indeed reflect who they are. Matt’s Assignment 3 – Brighten Your Day! Above are some images of “Brighten Your Day!” at the Children’s Museum of Pittsburgh. Have you ever wondered what it would be like if household products could see you and react to you? By using a machine learning library that detects people, their faces, and other qualities, this lamp is able to turn on and look at you when you look at it. However, the lamp will only respond to people who believe that it can come to life. Are you a believer? The mechanical components and wires were secured in a support structure made of MDF with a vacuum-formed plastic cover that I made for the installation. Here is a website with our documentation. I also uploaded the word doc with all the photos and everything. This piece explores how self-organization emerges in the search for synchronization, where synchronization appears to be an ubiquitous and old principle that holds together all living things. The installation consists of 144 entities who will synch with their closest neighbors, until the whole population is synched. The presence of visitors will disrupt the synchronization. BLACK BOX: consensus algorithm to synchronize pulsing. All of life and many inanimate processes rely on synchronization. Synchronization helps the cells of the heart beat together, neurons to communicate, fireflies to attract mates, etc. The emergent self-organization that arises from seeking synchronization appears to be an ubiquitous and old principle that holds together living things. This piece will explore the drive to synchronize. Several entities will have the ability to learn to pulse at the same time. This progression can be interrupted by the presence of people. There will be sound to the piece, that will communicate how synchronized the pieces are. If left to match up, the whole population will pulse together, in a slow but increasing crescendo. It will be interesting to see the effect of a living glowing, soothing, synchronized environment on visitors – will they synch up their breath or pace? Will visitors behave/feel differently when the system is out of synch or in synch? Will people be more attracted to the “searching” entities or the “synched” entities? Some constraint can exist, symbolizing a resource such as food/energy, which will limit the amount of time the synchronization can be kept. After which, the synchronization falls apart and chaos breaks out again. At this point the entities can be reset randomly or re-seed each other. Physical description: light support structure hangs from the ceiling. About 100 LEDs hang from this structure, pulsing rythmically. – should the system be able to maintain its synchronicity or have a built-in constraint? – how does chaos break out? This step has the possibility of being very beautiful. The idea is similar to Patrick’s box (“what they left behind” from Assignment 1). Here, instead of objects, people will submit drawings. 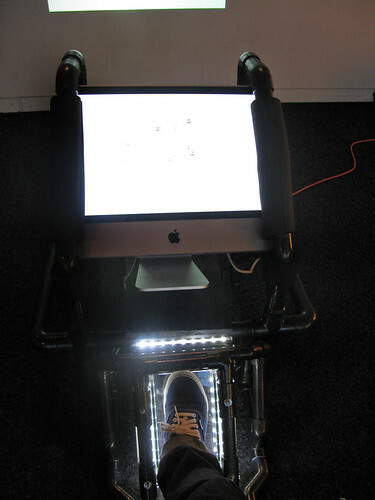 A drawing is passed into a rolling scanner that sends the image to the computer, which then decides whether to accept it or reject it. There are two large transparent boxes, one for accepted drawings and another for the rejected. However, when a drawing is rejected, it’ll be sent through a shredder(!) before being dumped in the reject bin… On the wall behind this contraption, we’ll project 5 best drawings so far, just as a curator would display them at a museum. We hope to see that people try to “learn” what the curator likes and does not like, and try to get their art accepted. We have not decided exactly what the pre-trained classifier would be trained on. A couple possibilities are: 1. a puzzle e.g. has to have 2. whatever we like. Another idea is to have colored papers and/or some pre-drawn figures on the paper to promote certain kinds of drawings. The colored papers would make the installation more visually appealing. Other work: getting a scanner to activate the computer… another option is to use a camera, but the same problem persists.